Hawaii Native Status: Introduced. This naturalized ornamental garden plant is native to eastern India. Description: The butterfly-like flowers emerge from between green bracts on the club-shaped inflorescences. 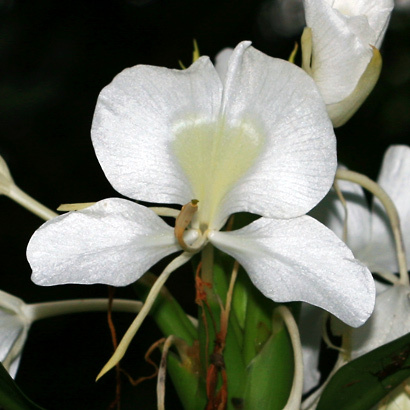 The flowers have 3 slender, linear, pale yellowish or greenish sepals and 3 spoon-shaped, white petals. There is pale yellow at the base of the top, largest petal. Each flower lasts only one day. The seeds are bright red. The pseudostems (formed by the leaf sheaths) emerge from underground rhizomes. The leaf blades are green, sessile or subsessile, and oblong-lanceolate to lanceolate in shape. 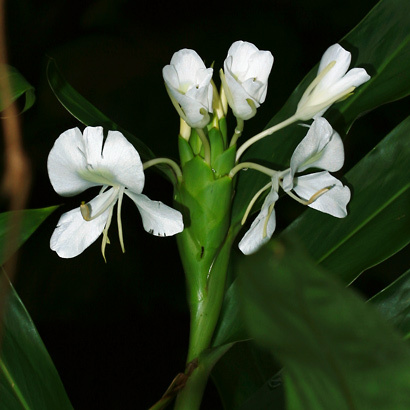 Here in Hawaii, White Ginger is an invasive weed in pastures and forests, and it is especially common along roadsides. The similar Yellow Ginger (Hedychium flavescens) has yellow or cream-colored flowers with darker yellow-orange at the base of the top petal. Edible – The young flowers and flower buds are edible. Fragrant – The flowers have a lovely, intense fragrance that perfumes the air. When cut, the flowers soon wilt and die, but they can still be used if you cut them immediately before a party or other special event.